So, the website’s now live. You’ve been paid and the website’s number 1 in Google – every’s happy, right? You betcha! I’m in the money! Oh? That’s nice! But what about the future – for you and your client? Who cares about them? I’m going to get loads of work! Riiiight. We all think after that one big success that work’s going to come in so fast we’ll be up to our necks in it in no time. The problem is it never (unfortunately) works that way. If you’re lucky enough to be in the above situation, good for you! But there comes a time for all of us when work slows down and as a result the money starts to dry up. That’s where maintenance contracts come in. Maintenance work is great – if you know what’s going to happen! Great! So I’m supposed to be a fortune teller now am I? Pass the tea leaves! As much as I’d love to be able to look into a crystal ball to see into the future, it’s a shame it’s not that simple. But, in regards to maintenance work, there is something that can be done! Oh, really? Tell me, tell me! We all know how important an up-to-date website is, it’s a shame that most of our clients don’t! Of course, when you Pitched for the job, you mentioned that in order to keep at the top of the search engine rankings they needed to update their site regularly. Now they’re seeing their hits drop it’s time for you to strike! It’s good practice to touch base with the customer a couple of months after the sign-off and delivery of the website. Firstly they’ll really appreciate the gesture – you weren’t just after their money, you actually care! Secondly, you can see how they’re getting on with the website and whether any of the changes they wanted to make during the build are relevant now. How you approach the subject of website updates and maintenance is up to you but ensure that you go about it in a professional manner and make the client aware of why and how they should be maintaining the website. They’ve agreed they need regular updates. But what do I do now? The first thing to do is to figure out how regularly these updates need to take place. Is it a monthly budget report that needs to go up? Do they advertise for staff on a weekly basis? Or do they just want their end of year financial reports putting up? 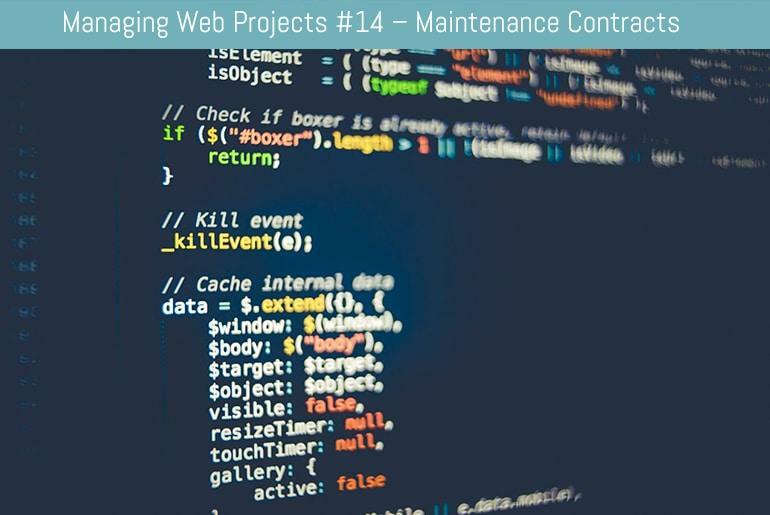 If the updates are once a month or less then it’s probably not worth the client entering into a maintenance contract with you, they’d be better off paying as-and-when the work was required. If the updates are required very often e.g. several times a day, then it would probably be more cost effective for the client to have some form of CMS installed. Although initially expensive, the savings in the long run will be worth it. If the updates fall somewhere between the two scales then a maintenance contract is ideal. Both you and the client know where you stand in terms of work, time and cost; and, more importantly, you have regular work coming in to keep you ticking over. Firstly, figure out how much time a month it’s going to take, then decide how you will run the contract based on that. If it’s only a few hours a month then you may allow the customer to roll those hours over into the following months so if they don’t have any updates at the time, they can have a couple of larger ones when needed. If there’s quite a lot of work involved you may want to cap the number of hours and not allow them to roll them over. This will prevent them dumping a lot of work on you that should have been a separate project. Whatever choice you make, I wouldn’t allow a client to roll time over from one maintenance contract year to another. That’s going to get messy and you’re asking for a whole world of trouble! You then have to decide whether you would like the client to pay monthly, quarterly or yearly. Of course this will depend a lot on the client and how they themselves pay their invoices. Right, sorted! Now all I have to do is sit back and wait! Lucky for you! But there’s one final thing you have to consider. How are you going to track the time spent on updates again the amount in the contract? You need to keep tight tabs on the amount of work you do or you (or the client) could be taken advantage of. Which ever method you use, it’s important that you keep it as up-to-date even down to the small 5 minute jobs so that you ensure you don’t miss out. So, we’ve now covered the full life-cycle of a project from inception to completion. In my final post on the subject I’ll give a brief round-up of what we’ve covered and a few thoughts on how it happens in the “real world”. Why Is My Website So Slow?